Sometimes you can find the best lumber right in your own backyard. Getting the wood milled can be difficult but if you are willing to do the work you can end up with spectacular lumber from trees right in your own yard. But I must warn you it is not easy. I had to cut down a beautiful white oak that I loved but it will yield lots of really nice wood. Granted white oak is not used on guitars but there are a lot of uses for this magnificent wood. The tree was about 80 feet tall and straight as an arrow. The bottom 26 feet or so of the tree could be considered a veneer quality log without a branch or defect and perfectly shaped. I had the bottom 24 feet cut into three 8′ sections so I could get some quality lumber. See video below. Once the tree is on the ground the problem is getting them to the mill. The mill guys came with a little machine to pick up these logs that weighted well over a ton each. They put them in the truck and off to the mill they went. Check out the video below of the little machine in action. I gotta have one of these! A few weeks ago lightning hit a tree less than 100 yards from my garage. I was in it at the time. A charge coupled into the overhead garage door opener and discharged into the cement floor next to me. It sounded like someone had thrown a marble into the floor with all their might. There were a few trees close to the house that people had advised I take down to prevent them from falling on my house and shop. I resisted because I love trees, especially the white oak between the house and garage. But this tree would cause the most damage if it fell. Because of where it was it had the potential to destroy the house and the shop at the same time so sadly it had to go. 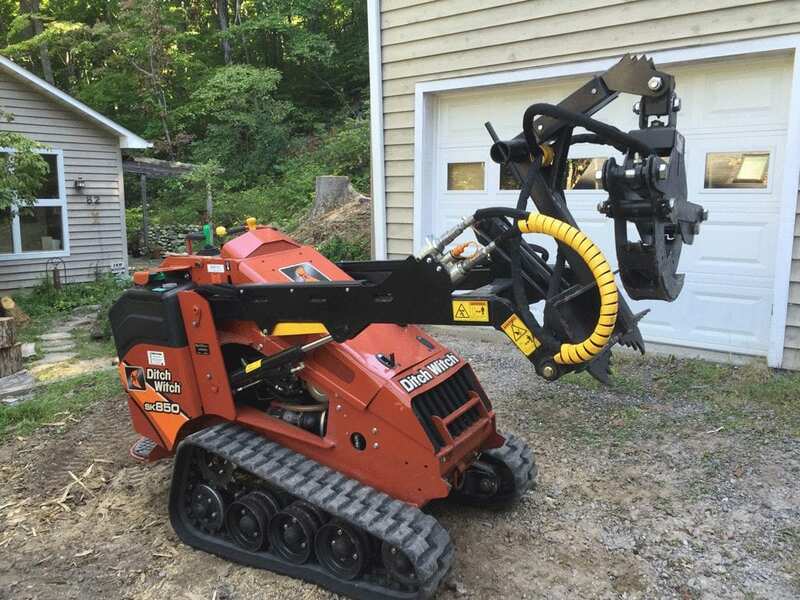 Check out the video of the little machine picking up the logs. I gotta have one of these! Monday I am going to the mill to watch them cut the log. Check back in next week for a video of the log being milled.